Wow, here is a cool instance of, y’know, someone actually reading State of the Commonwealth. Thanks to our post back in early September about Joan Osborne name-checking the Endtables in the New York Times, we’ve been contacted by Stephen Driesler, who confirms the rumored Endtables discography that we’ve been hearing about (and expressing enthusiasm for) elsewhere. Other aspects of the discography we can confirm is that it will be released by the excellent Drag City record label of Chicago, Illinois, and that it will include all six known Endtables studio recordings plus an undetermined amount of bonus material (as such, neither the tracklist nor the release date have been finalized). As regards any reissue project of this nature, there is a good chance that there are a lot of undiscovered materials that might be usable, perhaps just lying around in your basement or archives. Steve is asking us to help spread the word, in order to see if there’s anybody out there in Louisville or beyond who has any Endtables memorabilia, photographs, stories or ephemera they’d like to share for the project. And anything of interest related to the Endtables is fair game. So if you do have something you’d like to share, or know anyone else who does, please contact Steve through his email address: luna_pier@yahoo.com. Be sure to get it to Steve by January 25th! Brett Eugene Ralph’s Kentucky Chrome Revue, at the Air Devils Inn Tomorrow! Come on out to our first show in nearly a year. We’ve got two new members, lots of new songs, and even a few Xmas surprises. The current line-up includes Chris Reinstatler on drums, Kirk Kiefer on keyboards, Mark “Lupe” Hamilton on lead guitar, Justin Miller on bass, and Jamie Daniel on violin. The show starts at 10 PM, costs a measly $5, and also includes both Jon Ashley and the Whiskey Bent Valley Boys on the bill. The Air Devils Inn, one of Louisville’s greatest divey bars, is located at 2802 Taylorsville Road, across the street from Bowman Field and right next to Queen of Sheba (one of the best restaurants in town!). Australian Brett Dean Wins the Grawemeyer Award (C-J) – There’s a video clip of part of the first movement on the right panel of the C-J‘s online story. Century-old Mazzoni’s Closes in Middletown (C-J) – What a shame. Frankly, we’re not surprised given the tough economy’s effect so far on local independent restaurants (ie., a bunch have closed), and the relative remoteness of the location. Restauranteurs and other retailers need to reinvest in closer-in parts of Louisville, in our opinion. Obama Effigy-Hangers’ at UK Headed to Grand Jury (Bluegrass Beat blog, part of the Herald-Leader) – Indict ’em, Dan-o. The Mayor Held a Press Conference This Morning, Everything’s Getting Cut (The ‘Ville Voice) – Ouch. But Mayor Jerry, Why Aren’t The Books Open to the Public? (Louisville History and Issues) – We’d like to join the chorus of voices asking why Louisville Metro’s books aren’t on the record, for the public to peruse. To us, having the financial records of the city open to its citizens is a no-brainer. Democracy doesn’t work without transparency, Jerry. 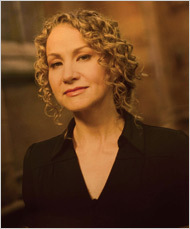 Joan Osborne Name-Checks the Endtables in the New York Times… and What We’ve Been Up To! We’ll be honest: we’ve never, ever liked the cloying, faux-soul sounds of Anchorage, Kentucky native Joan Osborne. Her 1995 hit “One of Us” — y’know, the song that posits the oh-so-ironic-but-not-really notion that God could be just like any ordinary shmoe — was quite possibly the nadir in a decade also notorious for such other one-hit unwonders such as the Spin Doctors and Ugly Kid Joe. Shudder. [This] reminds me of a new wave, late ’70s-early ’80s sound that reminds me of being 16 years old and sneaking into the only club in Louisville, Ky., that had bands playing original music. There was a band called the End Tables [sic] that my high school friends and I followed. It reminds me of pogo dancing and getting slammed into by ruffian teenage boys on the dance floor. Could this be? Did our little MOR darling Joan really get “slammed into” at an Endtables (spelled correctly) show? Did she witness Endtables singer Steve “Chili” Rigot in all his glory? Hrm. Well, anything’s possible, and she would’ve been around 16 or 17 during the time the Endtables were active. We’re skeptical. But hey, all’s fair, so if you’ve got some great Joan Osborne-at-a-punk-show memories you’d like to share with us, by all means do so in the Comments section. Oh and hey, we know it’s been ages since we last updated. Sorry about that. It’s been a really hectic (mostly in a good way) August. We went on a fantastic road trip vacation down to New Orleans (you can see a slideshow of pictures we took on our Flickr page), and we start a new job next week. Hopefully we’ll be back to regular updates here, but it’s too early to tell. We wrote about Louisville art-music crazies Circle X a little while ago, as their Prehistory record was recently reissued by David Grubbs‘ Blue Chopsticks label. You also might have seen the B-Sides column in LEO that discusses the reissue (and where member Rik Letendre’s name is misspelled). As it turns out, Mr. Letendre was recently a guest on the Strength Through Failure with Fabio show on WFMU, probably the best (and maybe the only true) free-form radio station in the entire country. You can stream the show and look at the entire playlist here (the playlist also includes songs from James Last, the Birthday Party and Public Image Ltd.). Special thanks to our pal Brian Labuda from Philadelphia’s Fun Vampires blog for hipping us to the show. Since it’s kind of a slow news day here in Louisville, we thought we’d take a few moments to reach back into the past and discuss one of our favorite subjects: Louisville Music History. The history of Louisville’s music, going way back even into the jug band times, has been pretty diverse and legendary, especially for a town of Louisville’s size. One would think Louisville might be behind the times, since Mark Twain famously said he’d wait out the end of the world in Kentucky, where it would happen 20 years later than everywhere else. Yet while this may arguably be true for other aspects of Louisville culture, this is not the case for Louisville’s music scene, especially since the late 1970s when punk rock blossomed here far before many other similar towns. And one of the stranger fruits of that blossiming was Circle X. Though possibly formed in New York, Circle X was born out of the ashes of No Fun, considered by most to be Louisville’s first punk rock band. No Fun consisted of Tony Pinotti, Bruce Witsiepe, Tara Key (later of Babylon Dance Band and Antietam, as well as a solo artist), Carty Bledsoe and Dean Thomas, and in the summer of 1978 they recorded a demo tape before splitting up (you can hear the fruits of their labor on the excellent Bold Beginnings: An Incomplete Collection of Louisville Punk 1978-1983 compilation on local label Noise Pollution — and read more about the early days of the Louisville punk scene in this Louisville magazine article by former Babylon Dance Band frontman Chip Nold). Once the lineup of Circle X solidified in New York (with David and Rick Letendre of Louisville’s unrecorded I-Holes joining the group), the formerly-punk band lunged headfirst into weirder, artier territory. Whether the big city’s burgeoning No Wave scene influenced Circle X or they influenced the scene is unclear; what is clear is that Circle X was one of the most unique, most mysterious and yet most un-heralded band to be involved in that particular place and time. Yet perhaps Circle X’s willful obscurity was self-induced — they left New York at the height of the No Wave era to reconvene in France (where they recorded a four-song EP, reissued on CD in the late 1990s by the Dexter’s Cigar subsidiary of Drag City Records). Upon returning to New York in 1982 (or thereabouts), they set out on finishing their Prehistory LP, which was released by both a French label (L’Invitation au Suicide) and an American label (Index). However, as the album didn’t sell particularly well (despite its inventive and crucial blend of the dark angst of No Wave and “goth” groups such as Mars and the Birthday Party with dub rhythms that wouldn’t seem out of place on an Augustus Pablo record), Circle X remained obscure. The remainder of the ’80s saw the group diversify with new drummer Mike McShane, guest violinist Lois Delivio and complex art performances, often involving constructions of great wheels, techno puppets and machines, as well as collaborative visuals with film makers Bradley Eros and Jeanne Liotta. In addition, the integration of synth technologies, tapes and samples now figured in the music’s stew of beauty and din. Members of the Circle X faction surfaced in offshoot projects like The Life of Falconettie (featuring Witsiepe and future Circle X engineer Mike Pullen), Gin Ray (with Letendre and Pullen) and Dear John (ostensibly a Circle X incarnation). By `89, Witsiepe, along with both Pinotti and Letendre, had begun publishing ANTI-UTOPIA, a limited edition artists’ book. A 1990 volume included a near-half-hour flexi-disc featuring Peter Van Riper, Mike Pullen, Christian Marclay, Bodeco, and a Circle X offering, “Crash/St. Sebastian of the Hood” (after a J.G. Ballard novel), a song later remixed for Matador’s New York Eye and Ear Control compilation. The veiled glory of Circle X’s past had metamorphosed into the purity of the marginal. Current drummer Martin Koeb (Dustdevils, Wall Drug, Loudspeaker) joined Pinotti, Witsiepe and Letendre in 1992 and four white-vinyl seven-inch singles for Matador, American Gothic and Lungcast Records were released over the course of a year. Titled The Ivory Tower, the records were compiled into a box set and re-released under the auspices of EDITIONS ANTI-UTOPIA in mid-’93. The package was limited to 100 and included an original performance photo from a recent European tour, a booklet fold-out and a silkscreen-printed mirror. The music within remained eerie, intelligent and harsh, yet far more aurally complex. Celestial, while out of print, remains a fantastic, mature artistic statement from a band who clearly synthesized many different types of music and art in order to create a sui generis whole. Unfortunately, not too long after its release, guitarist and founding member Bruce Witsiepe died of AIDS. Despite the renewed interest in the music, art and history of New York in the late 1970s and early 1980s (as evidenced by compilations such as the New York Noise series on the UK’s Soul Jazz label, as well as archival reissues such as the movie Downtown ’81 starring then art-world phenom Jean-Michel Basquiat), Circle X remains an enigma. However, Blue Chopsticks, a label curated by Louisville native and musician David Grubbs (of such groundbreaking bands as Squirrel Bait, Bastro and Gastr del Sol), has recently reissued Circle X’s Prehistory on CD. So while the history of the band may still be somewhat obscure, their music can and will live on. Download the song “Beyond Standard” from Circle X’s Prehistory record here. Prehistory is available at ear X-tacy Records on Bardstown Road in the Highlands. You are currently browsing the archives for the Louisville Music History category.